PBL – the final steps. Two weeks ago, I described the first five steps of the problem-based learning (PBL) method. 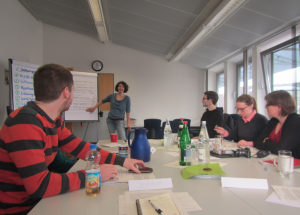 Last week, we continued with the workshop and went through the final steps. I am going to describe all the different methods in Wednesday’s post, but today I want to focus on the PBL method. 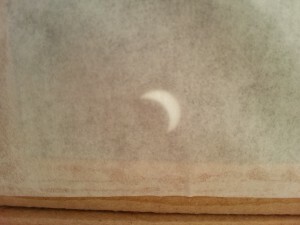 We had planned the workshop from 9:30 to 12 am, which luckily coincided pretty much exactly with the solar eclipse. Originally, we wanted to follow the method, i.e. bring together everybody’s results and discuss their merits, and only then start our observation. The idea was to watch over the period of maximum coverage because we thought that would be the most exciting part. 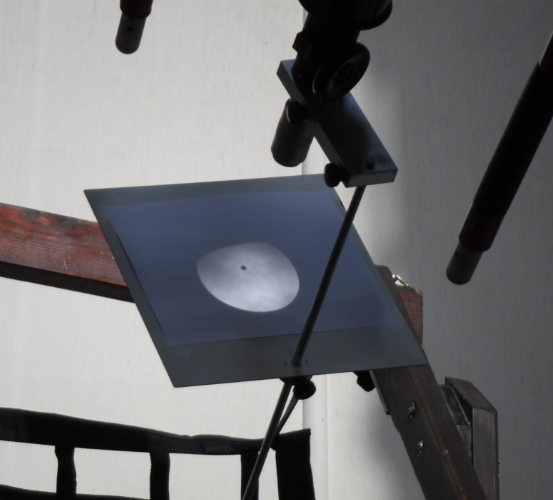 Luckily, though, facilitator Siska was flexible enough* to let us start observing only a couple of minutes into the workshop, when someone realized that we could actually see the moon moving in front of the sun. Everybody got super excited and we even brought in our colleagues who didn’t participate in the workshop to watch with us. After a while we got back to work, and then clouds started to appear and the weather changed completely. While we had had completely clear, blue skies during the observation, it now became overcast and foggy. Good thing we didn’t wait! So there were a lot of things to be learned during that workshop, too. (Remember, the topic of the workshop wasn’t really the solar eclipse – we had just used it as an example case. The real goal was for instructors to experience the method before they are to use it in their own teaching!). For example: If your group gets excited during the process – let them run free for a bit and use the momentum to your advantage. You miss the best learning opportunities if you don’t! * need more proof of her flexibility? She was only that very morning told that she would have to fill in for Marisa, who wasn’t well enough to continue running the workshop! This entry was posted in method and tagged active learning, PBL, PBL workshop, Problem-Based Learning, solar eclipse on March 23, 2015 by mglessmer. In preparation of our solar eclipse PBL workshop, my parents came to play. And they brought the Astromedia solar projector cardboard kit! 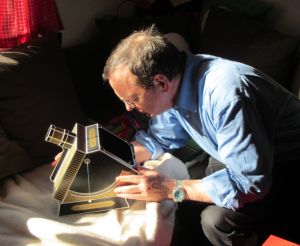 It took us the better part of a day to assemble, but when we were done we could even test it in a sunny corner of my couch! 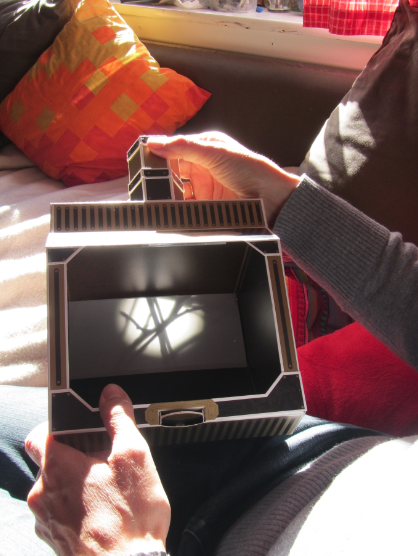 There were tiny twigs between the projector and the sun, which made for beautiful projections. Plus it was amazing to watch how fast the sun was moving (or, to be precise, the Earth was turning). 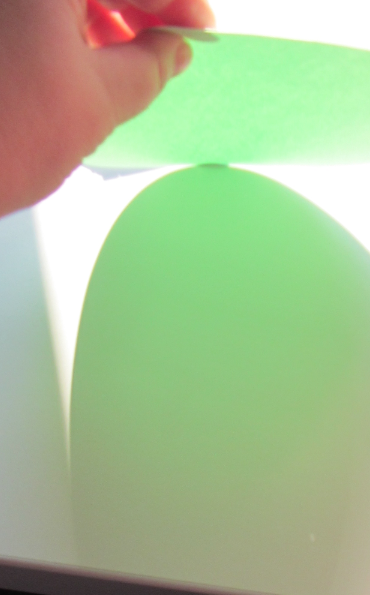 In the space of 30 seconds, the projection changed from the left to the right photo below! Shadows of twigs. Absolutely same angle and everything, 30 seconds apart. 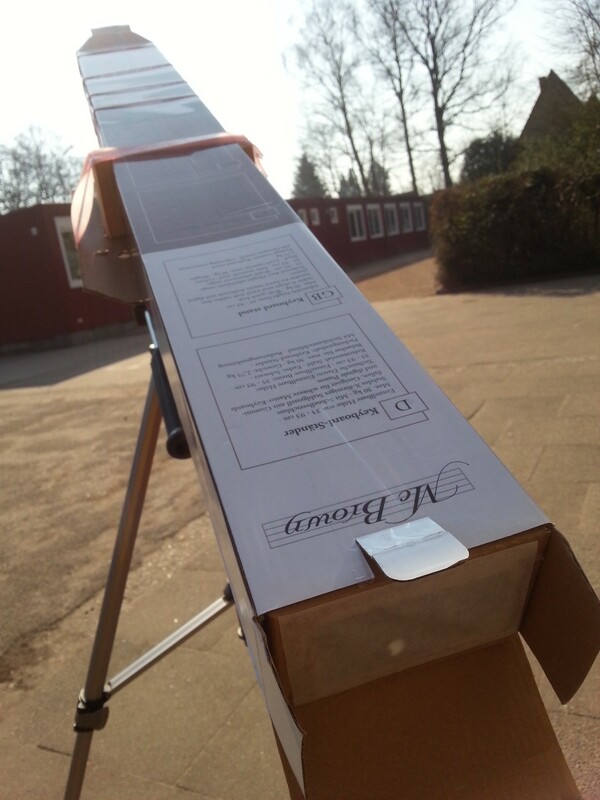 This entry was posted in observation and tagged solar eclipse, solar projector on March 20, 2015 by mglessmer. 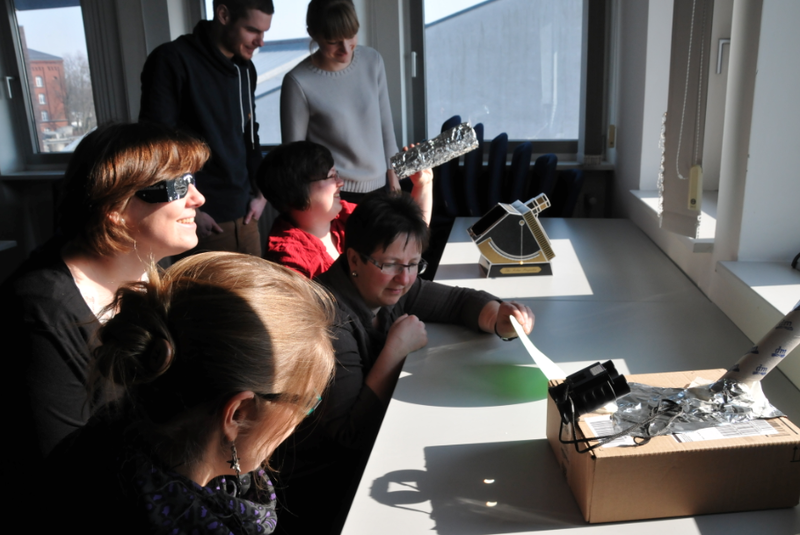 Workshop on PBL, using the upcoming solar eclipse (on Friday!) as a case study. I am currently attending a workshop run by one of my all-time favorite colleagues, Marisa, on Problem-Based Learning. The workshop is aimed at people who want to use PBL in their teaching, and is split into three sessions. 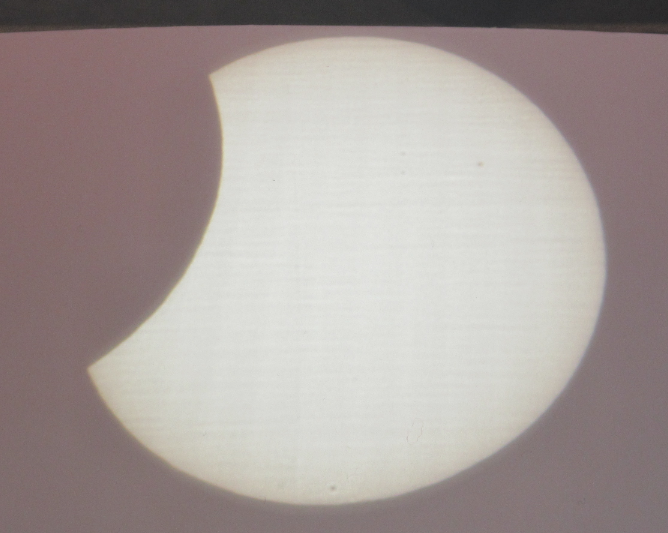 By pure dumb luck I realized that the second session will be on March 20th, the day of the solar eclipse. So of course I had to hijack the workshop a make her write a case study on that topic! (We really had to – I don’t think we could expect anyone to sit inside and work on some old case study if a solar eclipse was happening outside). I am going to use that case and that workshop to talk you through the concept of problem–based learning. In a nutshell, this is our case: Imagine it’s your god-daughter’s 7th Birthday on March 20th, 2015. She’s super into astronomy and you want to watch the solar eclipse with her. You don’t want to buy equipment, but you know she gets very excited and therefore need to make sure she’s ok. What do you do? During the first workshop last Friday, we went through steps 1 to 5 of the Maastricht PBL model. Before the first step, Marisa gave a brief introduction to the method, and picked someone to document the discussion. 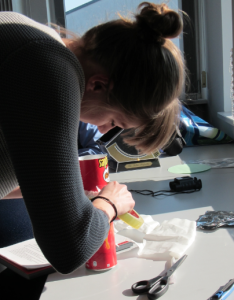 Usually you would also pick someone to lead the discussion, but since we were all inexperienced with the method, Marisa took that role herself – something she’s recommend we do the first time we do PBL in class, too. In this step, participants read the case and make sure they understand all the terms. For example, in our case, people discussed “equipment”, “household items” (which we had said they could only use for their equipment) and “solar eclipse”. Discussion here is merely to clarify that everybody reads the case the same way – if terms came up that we couldn’t come to an agreement on in this step, we wouldn’t do research now but postpone it to step 2. Here, all possible questions that we might want to answer during this PBL case were collected. Again, we were not answering anything yet, just collecting facets of the problem that people thought were interesting and should be investigated. For us, this meant for example “what can we use to protect our eyes?”, “will we need to make sure our god-daughter gets out of school so we can take her to watch the solar eclipse?”, “how much background do we want to convey to her?”. The second question – about how we’d get her out of school, was answered by Marisa: We can assume that that is not an issue. So here the tutor can interfere and guide the discussion if it leads too far from the desired learning goals. In this step, we collect all kinds of possible answers to the questions brought up in step 2. Since this is still a brainstorming phase, they should not be judged or discussed, just collected. So for example we came up with different activities that we could pursue with her in case the weather was bad or possibly for giving her a bit of a theoretical background before watching the solar eclipse. Now we took keywords from phase 2 and 3 and sorted them. 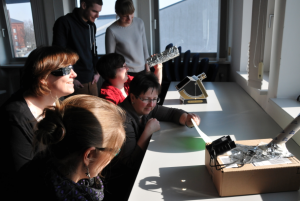 As a group, we didn’t actually decide on whether to sort by importance or by logical order of steps (so for example if we looked at the weather forecast and were sure we would not be able to see anything, we would not need to look into eye protection, however eye protection seems really important and also fun to investigate). It was interesting to see how it led to quite some frustration that people weren’t sorting following the same criteria, yet nobody “made” the group decide which criteria they wanted to use. In this step, the structure found in step 4 is being written up in complete questions – those are the questions that will be answered later. So all that is missing now are steps 6, “Searching for Information”, which students are currently doing and which should be finished by Friday, and 7, “Synthesis”, which we will do on Friday. Working with people who will later use PBL in their teaching, one of the important points was to let them experience what it is like to be a student in a PBL setting. Seeing how frustrated some people got, and how we really often didn’t know what to do was super important to get an idea of what it would be like for our students. Until now, nothing “step 6″ish has happened. I am curious how much work outside of the workshop is going to get done, and if it will get done by a group or by individuals. I’m kinda itching to get the group together to discuss, but I’m going to try to not do it and see what happens. 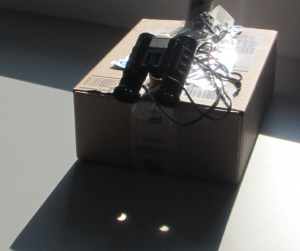 This entry was posted in method and tagged active learning, PBL, PBL workshop, Problem-Based Learning, solar eclipse on March 18, 2015 by mglessmer. 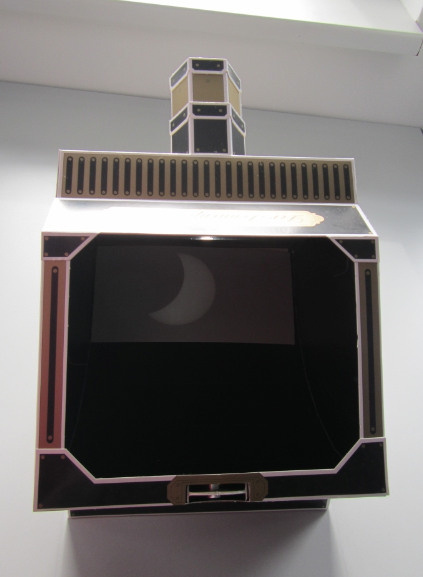 Transit of Venus and upcoming solar eclipse on March 20th! In 2012, I happened to be at an ESWN workshop in Madison, WI, when, during one of the breaks, one of the participants mentioned that it might be possible to get into the historic Washburn Observatory to watch Venus’ transit. Of course I had to go! We stood in a very long queue under overcast skies for a very long time. We slowly approached the observatory, all the while watching people ahead of us go in and leave disappointed – due to the clouds all they could see when inside were live streams from other observatories. Still, there was a lot of people still in front of us. We had dinner plans and we knew that we would have to be very lucky to make it in and out of the observatory and to the restaurant on time. Half our group left in order to not be late at dinner. The rest of us stayed, still hoping. And then we were finally inside! The observatory itself was impressive enough, but then right when we were inside, the sun broke through the clouds. All the astronomers who had been there for hours and not seen anything got super excited, as did, of course, the rest of us. Having waited all that time, knowing that we would very likely not be able to see a thing, and then coming in the moment the skies were opening up? Unbelievable. I still get excited thinking about this 3 years later. 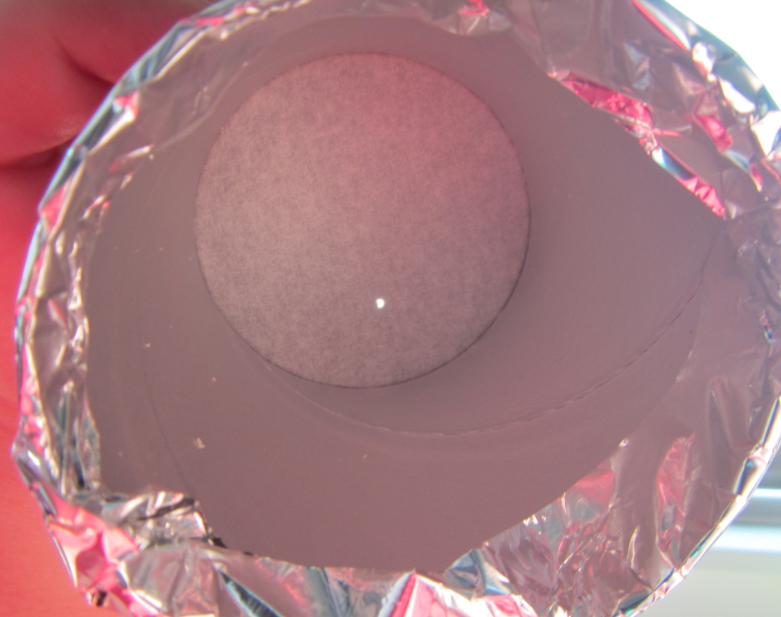 This entry was posted in other and tagged solar eclipse, sun, transit of Venus on March 16, 2015 by mglessmer.